Where Are All The Teacups? You are here: Home / Articles / Where Are All The Teacups? With the latest decorating and collecting movement focused on that of “Romantic Country”, “Shabby Chic”, “Paris Apartment”, “Romantic Roses”, “Cottage Chic” and “Pretty Pink”, collecting tea cups and saucers is a hobby that fits into any of these decorating categories as well as being financially affordable during these hard economic times as many vintage English tea cups and saucers can be picked up for around $9.99 on EBay, at your local thrift stores, flea markets, antiques shops, and sometimes for free from grandma’s collection. In the early 1600s the fist teacups were actually little bowls from China that were used to drink from and in the late 17th century teacups were made from sterling silver and only the elite and wealthy of society had them. The teacups we are familiar with today came about sometime in the 1800s when cups where fitted with handles. Primarily teacups we find today are made from Fine Bone China, Porcelain, China, Stoneware and Earthenware. Porcelain is fired, glazed, and re-glazed and Fine Bone China has very finely ground bone powdery ash added and this makes it extremely strong with a very white appearance. 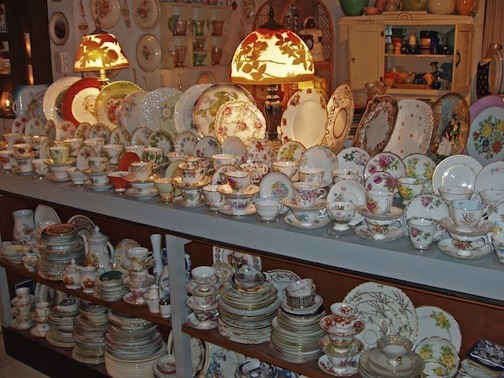 China has similarities to bone china but it is made with additives to make it strong. Stoneware and Earthenware are not as feminine and dainty of porcelain and are much heavier. Teacups can be footed or flat bottomed or are demitasse. Footed teacups are used for tea and coffee. Flat bottom teacups tend to have a matching saucer and are primarily for tea. Demitasse cups are smaller and very pretty and used for chocolate, espresso, and Turkish coffees. Today’s collectible teacups are made in England, France, Germany, Bavaria, Italy, Occupied Japan, and Japan. Manufacturers like Royal Albert, Royal Doulton, Herend, Spode, Worcester, Shelley, Wedgwood, and Rosenthal are but a few collectible brands and make very gorgeous items! Deciding on what patterns, colors, styles, and brands to begin collecting may come naturally to you or it may take you a bit of time researching and looking to see what appeals to you. I love vintage teacups and all types of fine china and porcelains. Patterns in chintz, florals, animals, reticulated, openwork etc… I love it all. It might sound strange but, having a display in a cupboard, china cabinet, or right on the kitchen table and looking at something so very pretty gives me something to feel joy about as I sincerely appreciate the beautiful colors and craftsmanship that went into creating the item as well as a sense of wonder when I think about who the person was that owned the items before me and what kind of life did she have.